Children and staff at St James’ CE Primary celebrated recent successes with a special guest. Weherby Town Mayor Coun Galan Moss visited to find out how the school is one of two most improved in Leeds with progress in Key Stage 2 (Year three-six) substantially increasing in the past year. 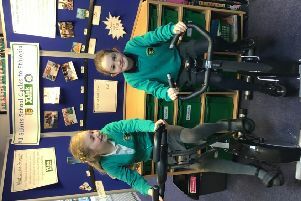 And pupils are excited by the new gym equipment installed, thanks to funds raised by the PTA, at the front of the school for them to play during breaks and lunchtimes. Miss Beatson, Head of School, said: “Our school mission is to be a happy and healthy place to learn. Coun Moss has chosen to support local PTAs in order to build relations between the local council and schools during his time as Town Mayor. “I was privileged and honoured to be invited,” said Coun Moss. “It brings back memories because I enjoyed my time as governor of the school and I never thought I’d be returning as Town Mayor. During the visit Coun Moss celebrated the official opening of its gym equipment and older pupils enjoyed a question and answer session, where they learned more about the Town Mayor’s role. Olivia and Rodi, pupils in the Year 5 and 6 class, discussed the changes to the school with the special visitor. The school has marked the success with a new logo and sign at the front of the school.